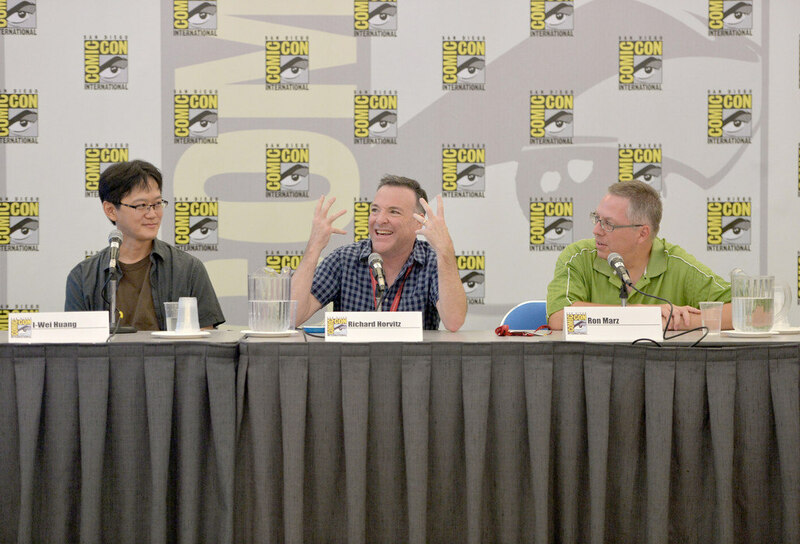 The Skylanders Comic-Con panel was a success! 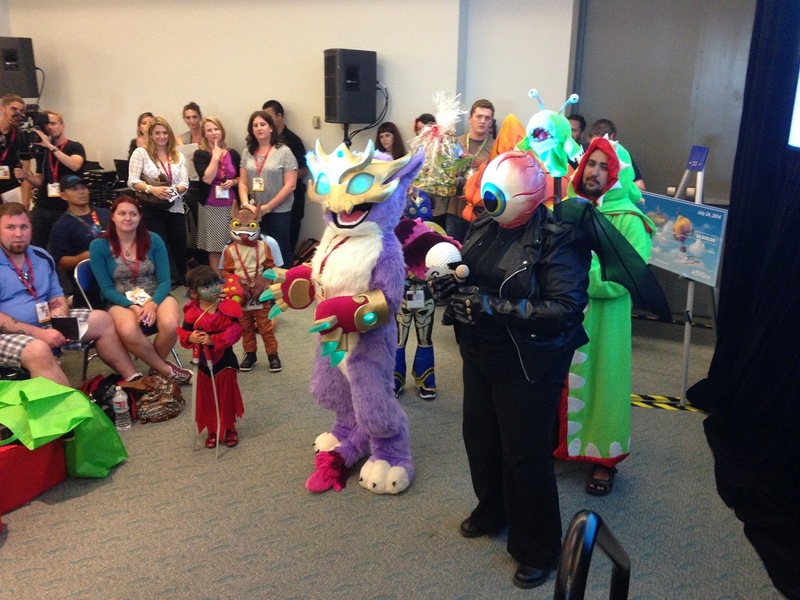 The panel was great, and the costume contest was amazing! There was quite a turn out, packed with over 480 people, and had to turn some away :( Sorry for those who waited but were unable to get in! If Activision post up a video of the panel, I'll update it here. But for now, here's the eye candy that I brought and showed at the panel. There were several slides missing from my presentation, but I’m posting all of the images here. 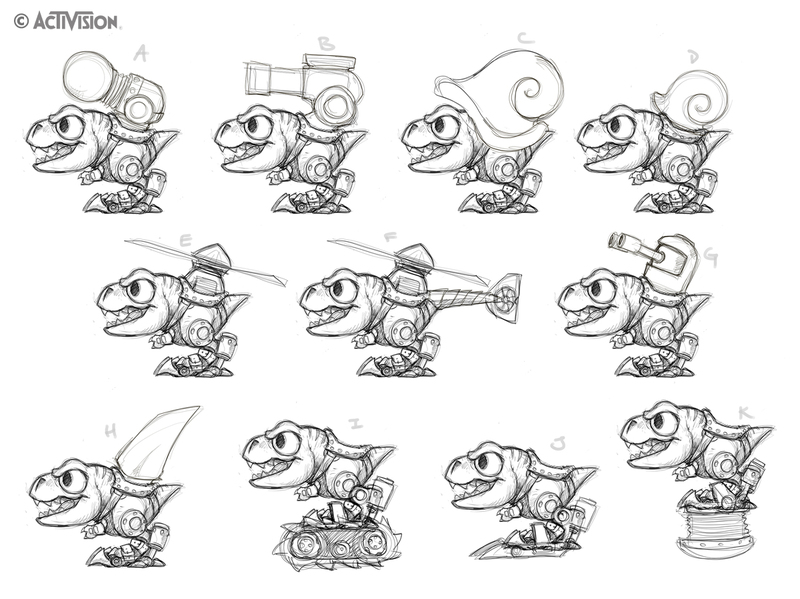 We usually don't show much of the character concept art for Skylanders, so I'm happy to have the opportunity to show the fans at Comic-Con, and now, to you all! 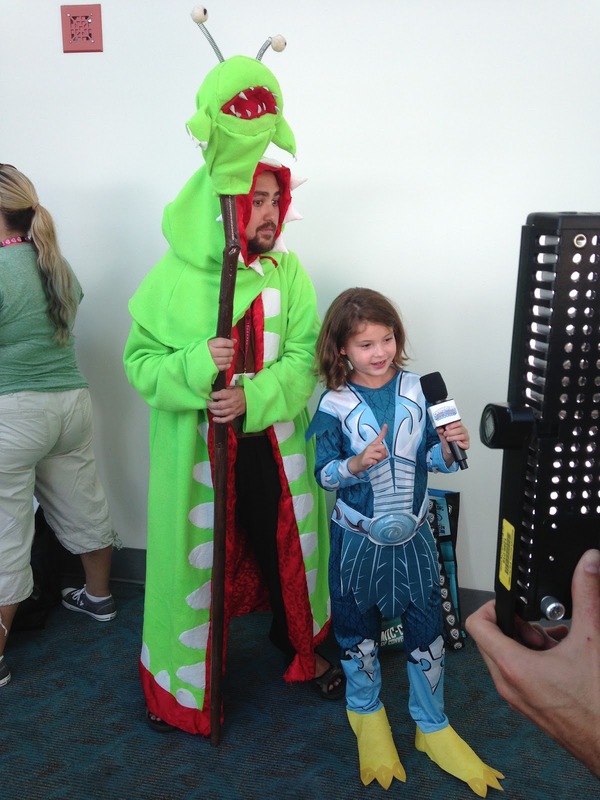 More Video Coverage on WIRED, Discovery Channel, NBC. Magazine coverage here, and my website: www.crabfu.com. 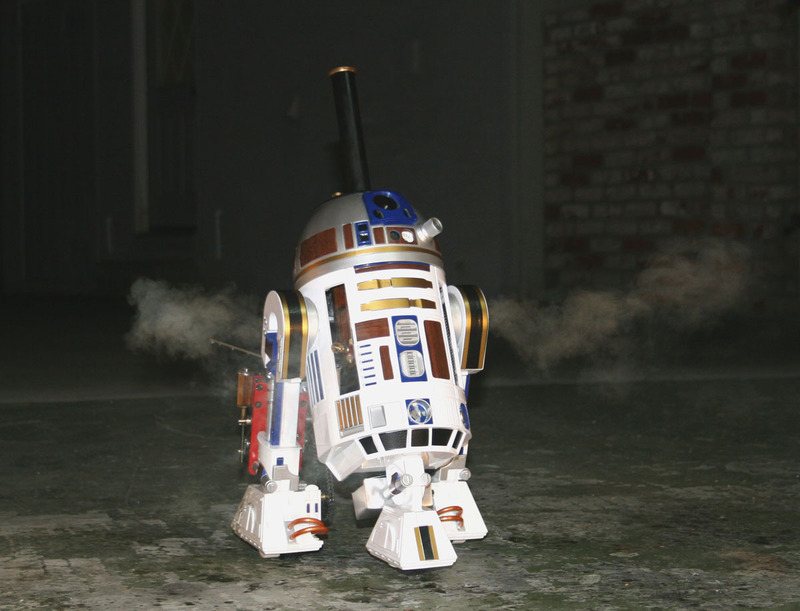 My tinkering skills helped in prototyping the early toy models and hardware. Along with the real wizard of Skylands, Robert Leyland, a TFB programmer with a hobby in electronics, hacked together the first portal. 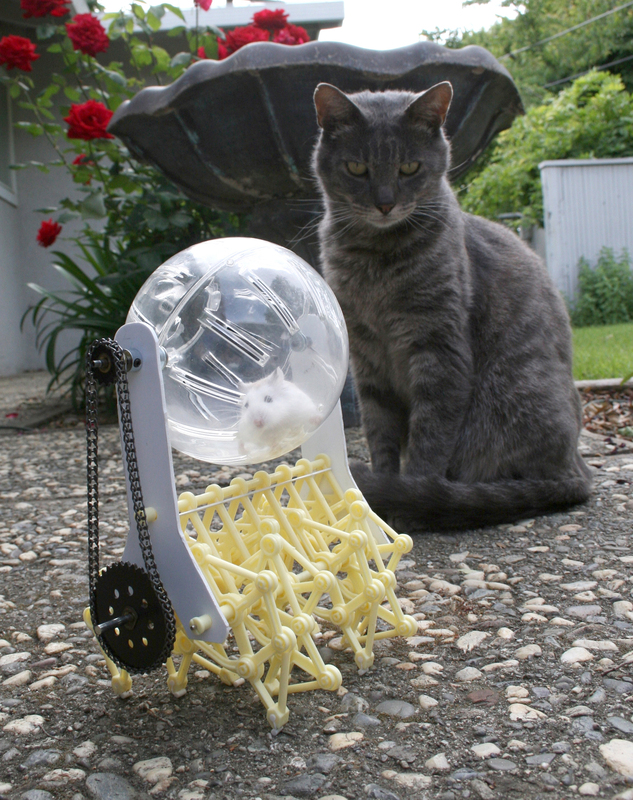 It was made out of PVC pipes, kitchen sink drain cover etc. 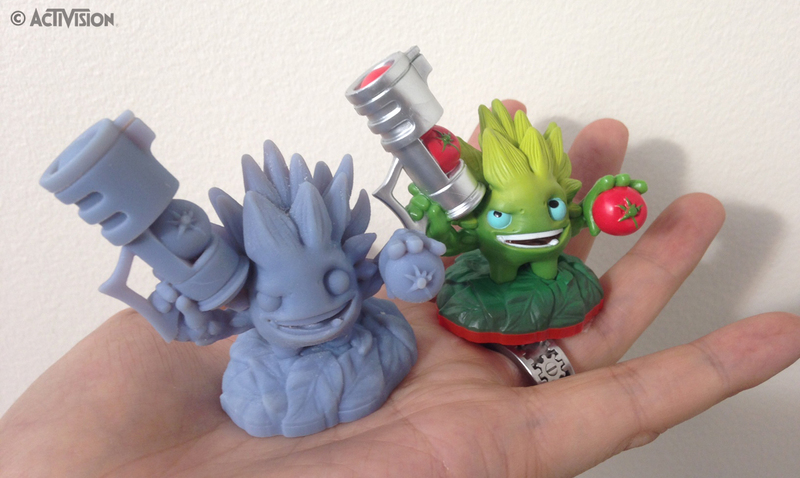 Early prototype character toys were crudely made by hand with Sculpy, and cast in silicone molds. 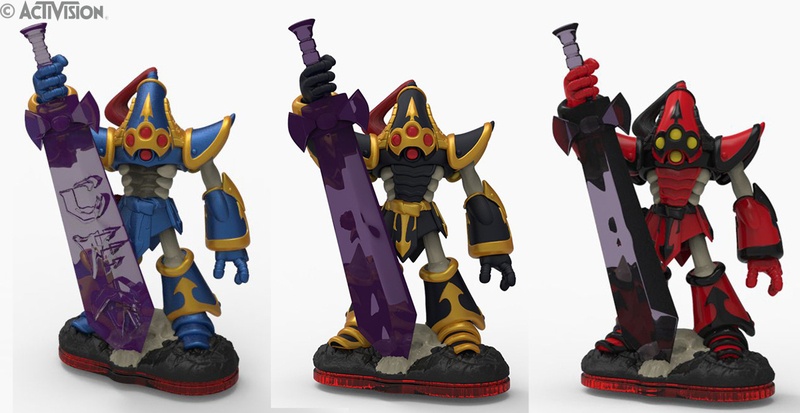 They were hand painted, and although they didn't look perfect, they got the idea across of this Toys-to-Life experience. 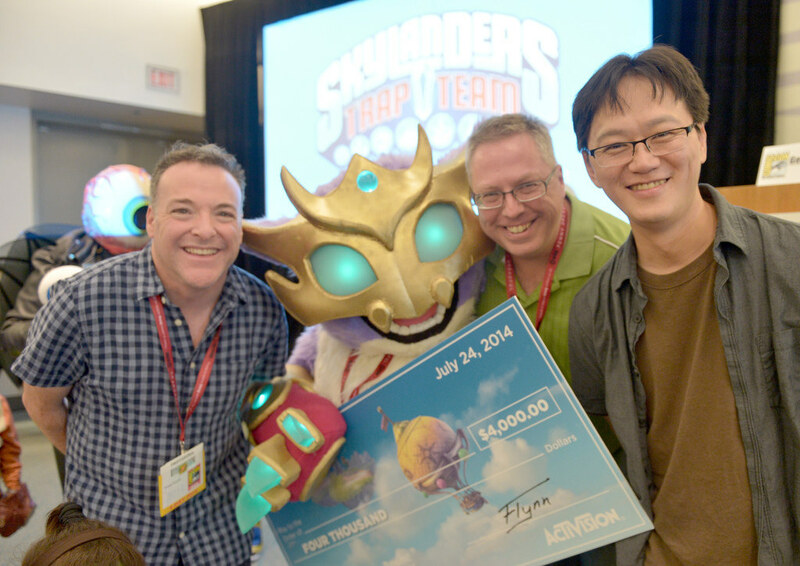 Skylanders was an idea that sounded crazy on paper, but as soon as we touched the toy figure, and experienced the magic moment of the toy coming to life, we knew that we had something special. Luckily, Activision did too. which made really good reflectors for the LEDs. of the body. The head was casted from a separate mold. 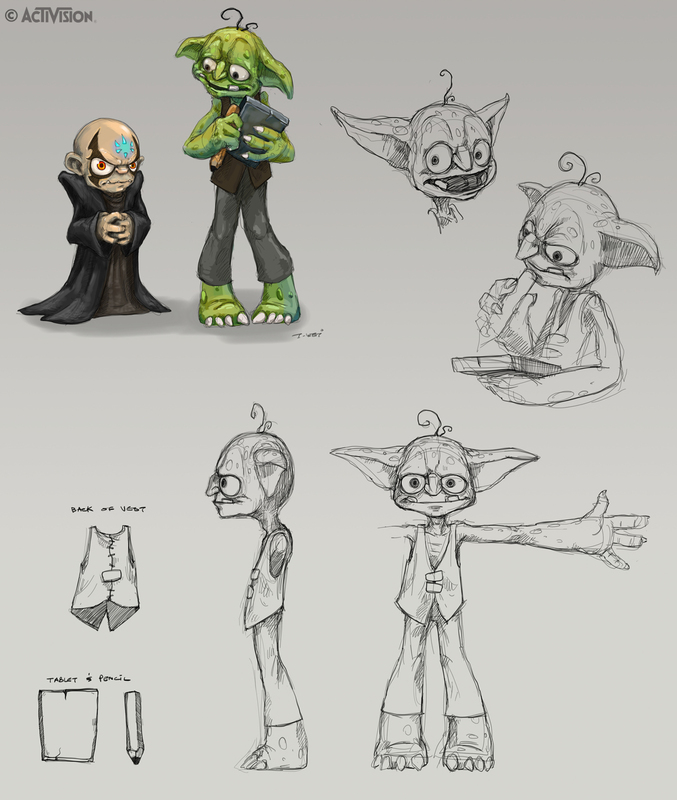 One of the most common questions that I get asked is "how do you come up with characters?". 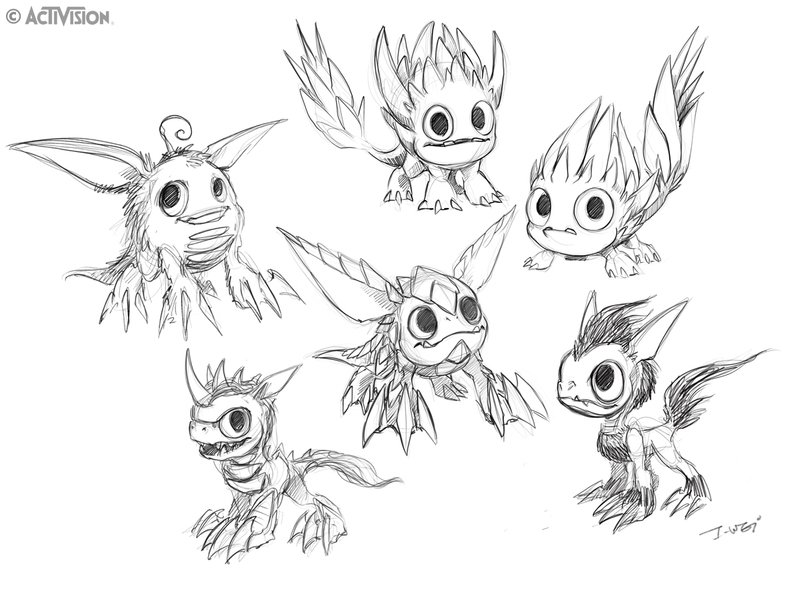 Here are some examples of the concept process. I pull a lot from nature, which has always been my biggest influence. 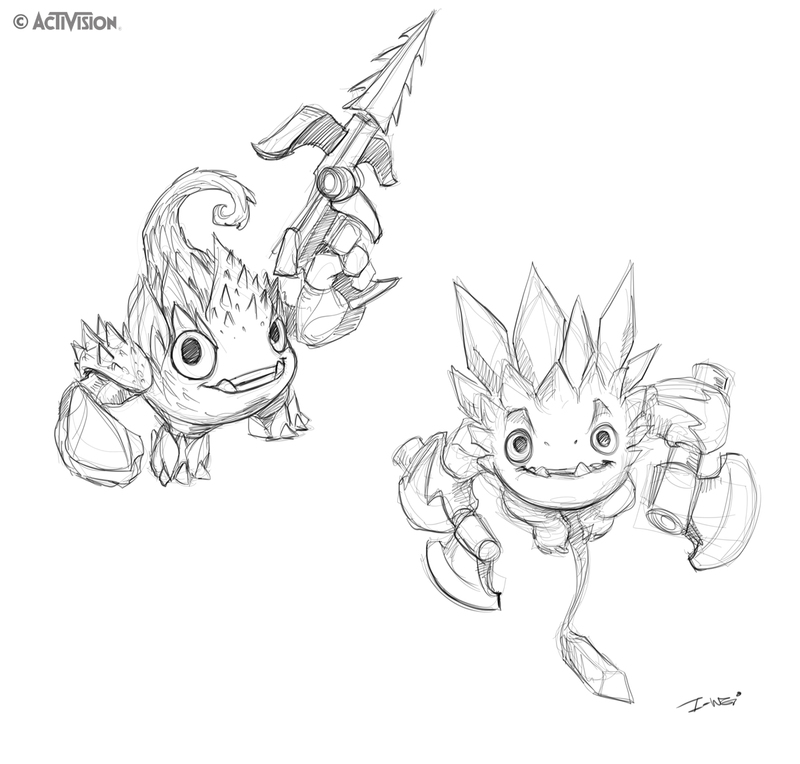 Food Fight begin like most Skylanders, just random doodles. 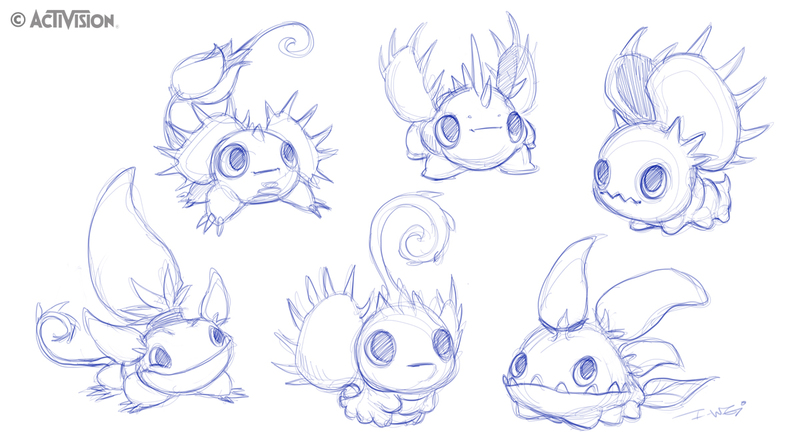 I was trying to come up with a plant based little critter, and explore lots of different ideas on a page. He started feeling very cute, but lacking any sense of a “hero”, and doesn't look like he would do well in a battle. I then explored more on the character, trying to find a cool angle to take him. 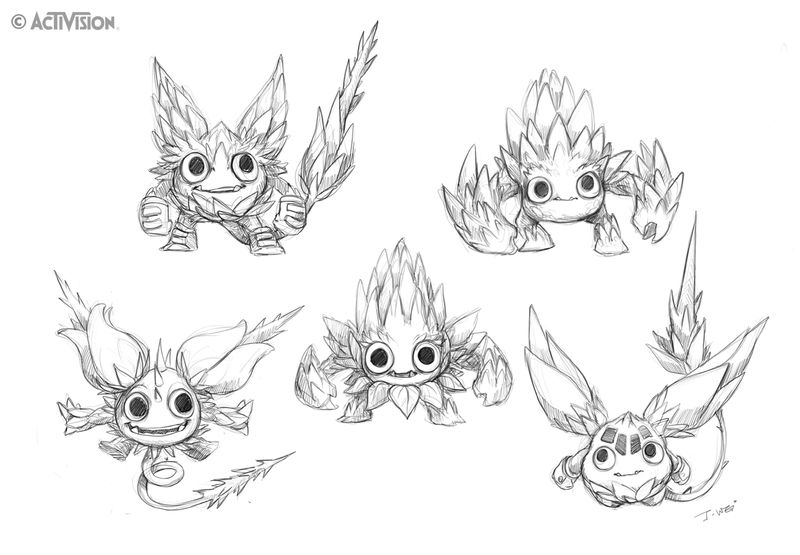 One aspect that I really liked with this guy, is the tactile feel of the spiky bits on his head. There is something very primal about wanting to pick up an object, just to feel it with your fingers. 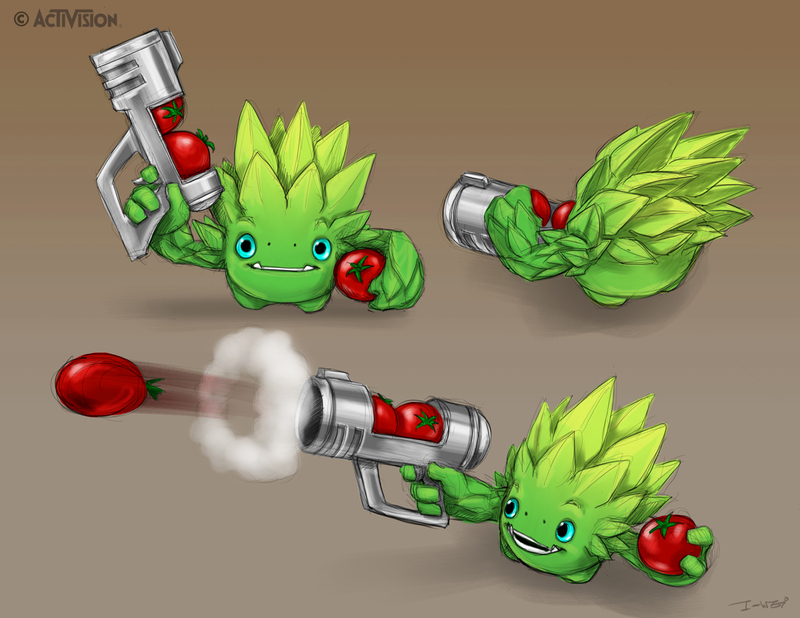 I wanted that to be a big part of him, so he turned into a artichoke-ish character. The next step is what weapon to give him. He is a cute little guy, so I wanted to balance him out a bit with a cool weapon. I explored some different guns types, and shooting different veggies. 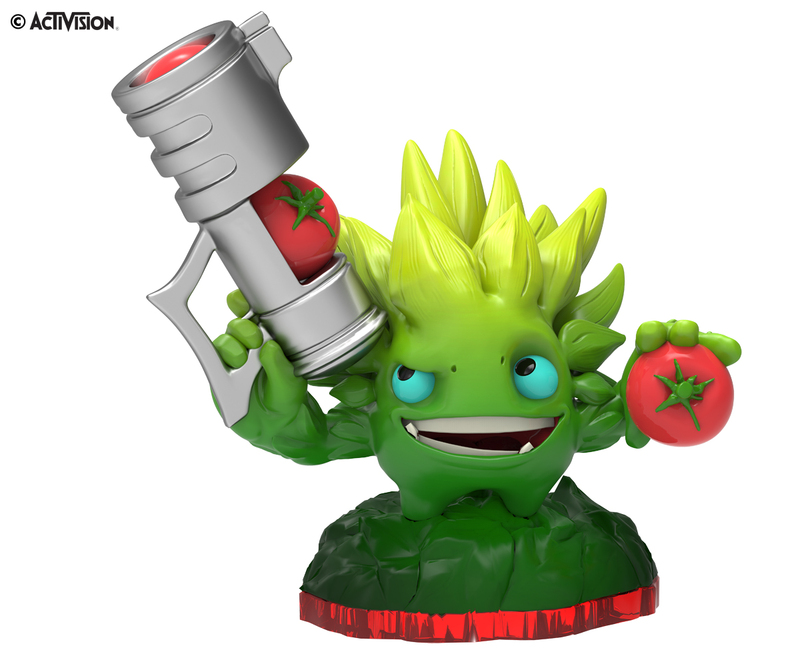 But in the end, we went with something very simple… Tomato gun! 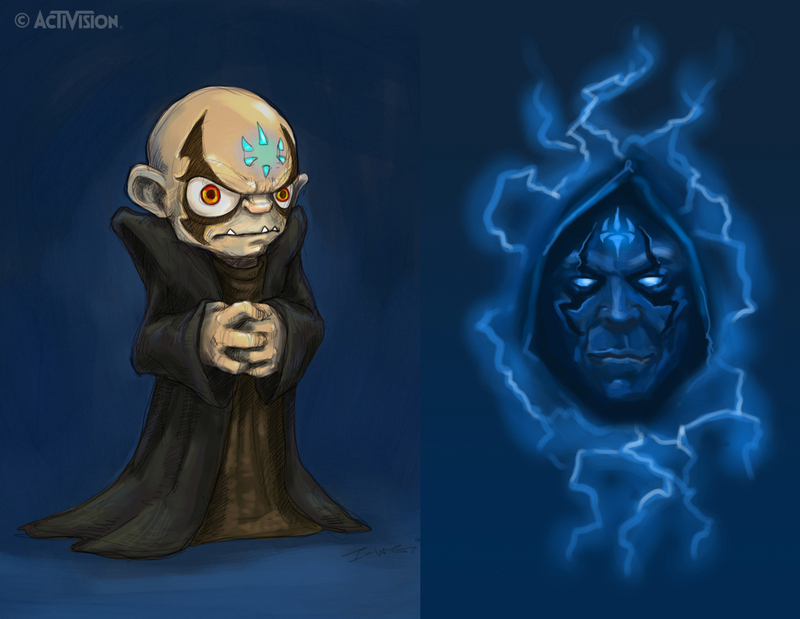 Next, I'd like to share a couple of examples of characters that lay dormant for a while, but eventually came to be. Sometime the hardest characters turns out to be some of the best. 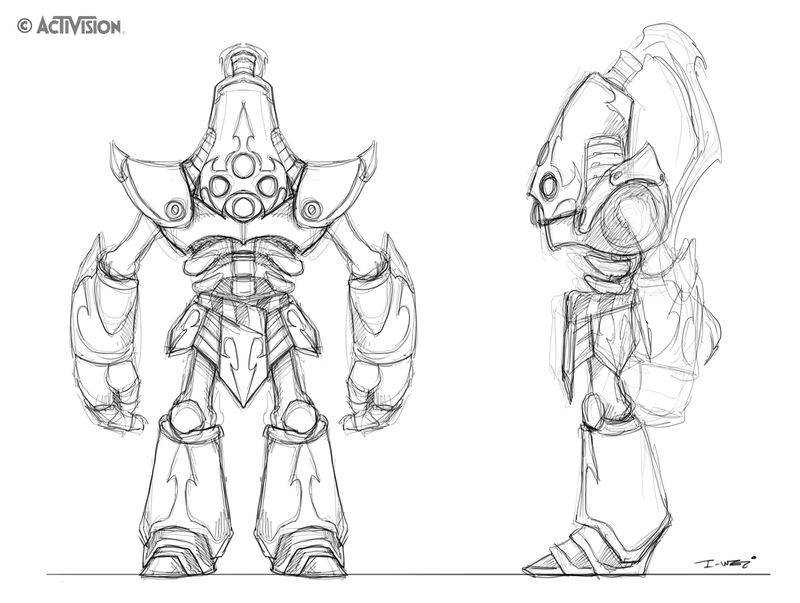 Kript King started out as the very first Giant. 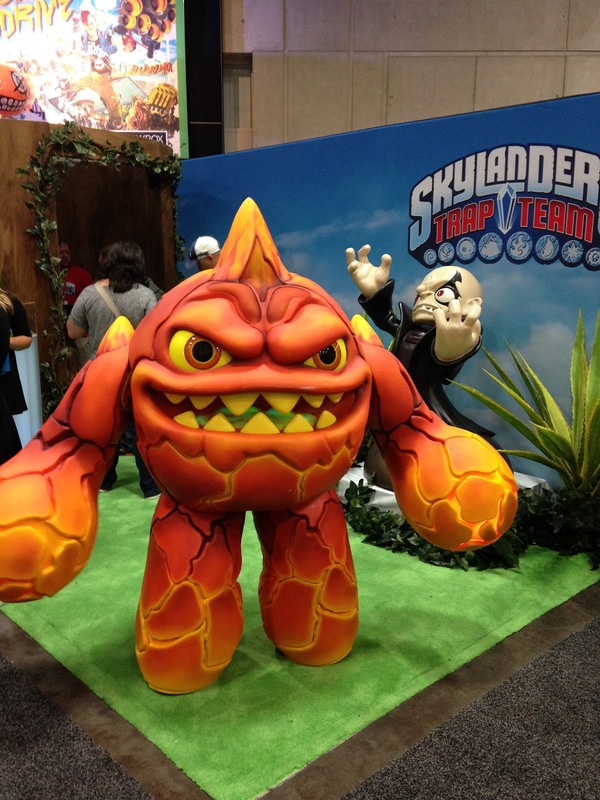 I was thinking of what it means to be a Giant in Skylands, what a Gaint should feel like. So I took Chop Chop, and made a ultra version of him, a Chop Chop Daddy, I kept calling him. 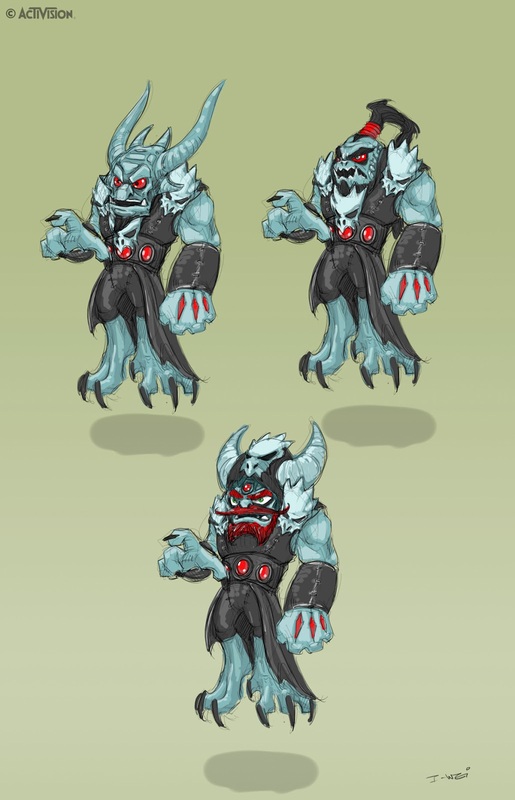 In the end, we didn't use him as the Undead Giant (Eye Brawl took that spot), but I wanted some way to bring him back in Trap Team. He went through some changes, mostly in color and proportions, but largely retained his look and feel. 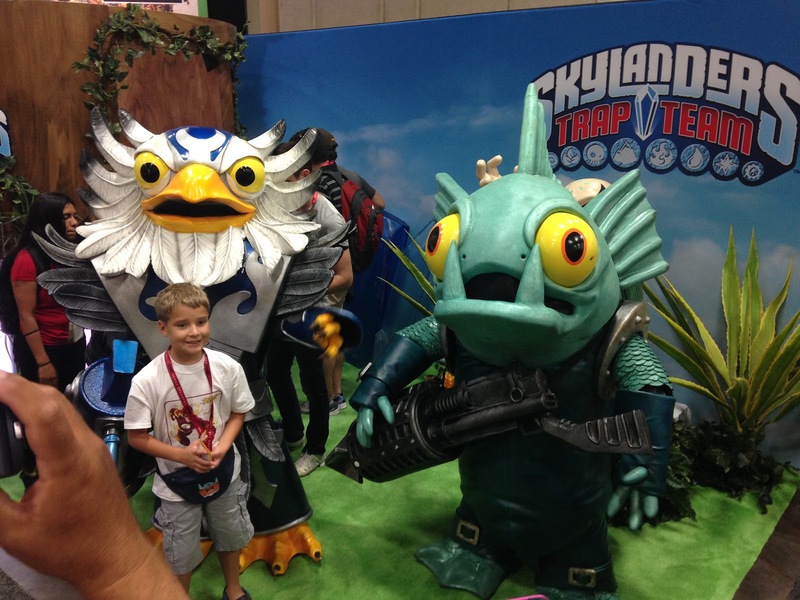 I am very happy with the way that he eventually turned out, and glad to see as a Trap Master Skylander. 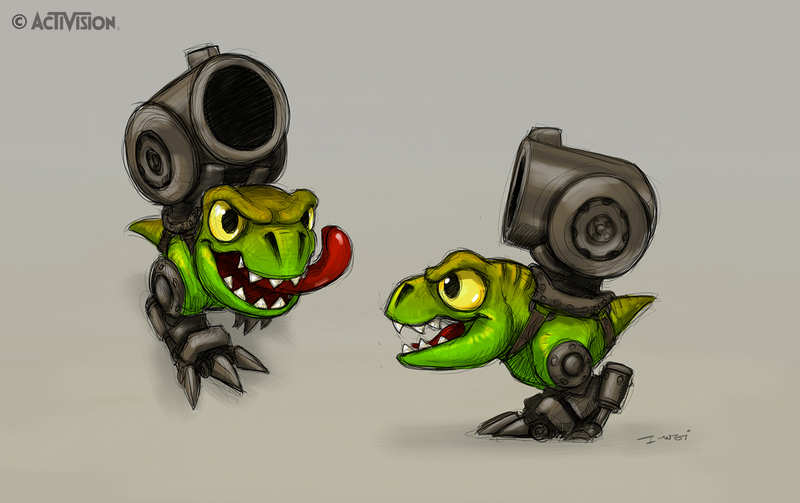 This dude started out when Nat Loh, one of our game designers, asked if I could make a Tech T-Rex with mounted guns. If you personally know me, you know that I love dinosaurs and other prehistoric animals. In fact, I have an unhealthy trilobite fossil collection. So, I was in love with the idea of a T-Rex in Skylands, but for the life of me, could not figure out how to make a T-Rex Giant work. 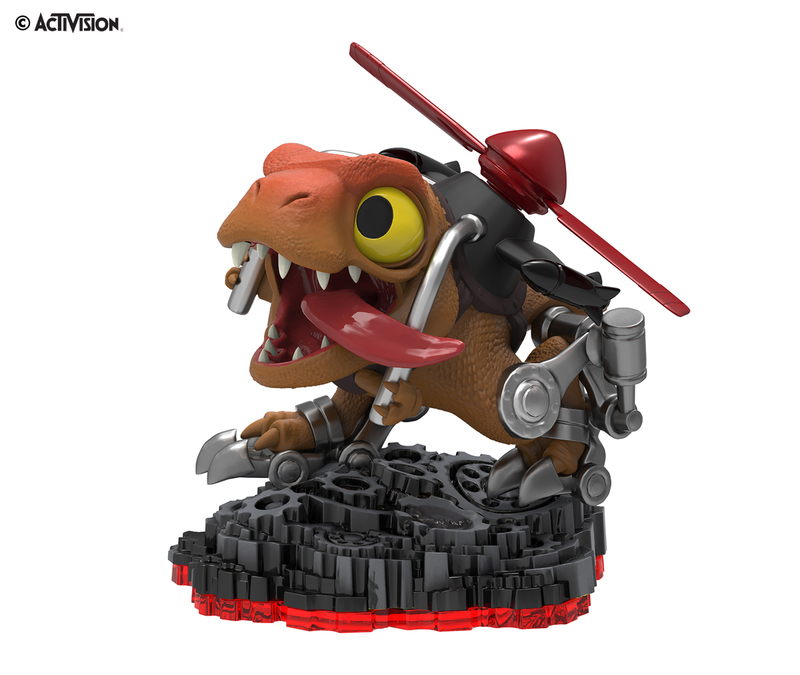 T-Rex's are more horizontal than vertical, which doesn't play nicely when trying to fit onto the portal with other toys. And we'd have problems trying to fit him in the blister pack package, being so horizontal. 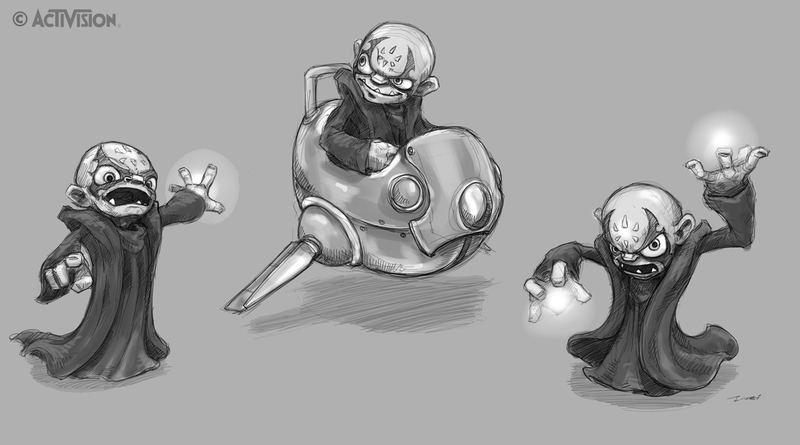 In the end, we tried other ideas for the Tech Giant spot, and eventually ended up with the fast shooting tech robot, Bouncer. 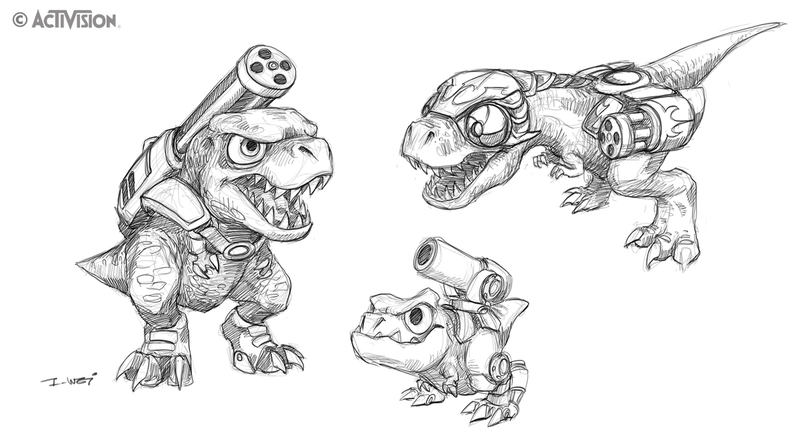 In development of Trap Team, I decided to take another stab at a Skylander T-Rex, and made him as stubby as possible. I really love they was he was feeling here, he just struck a really nice chord with me... did I mention that I love dinosaurs? 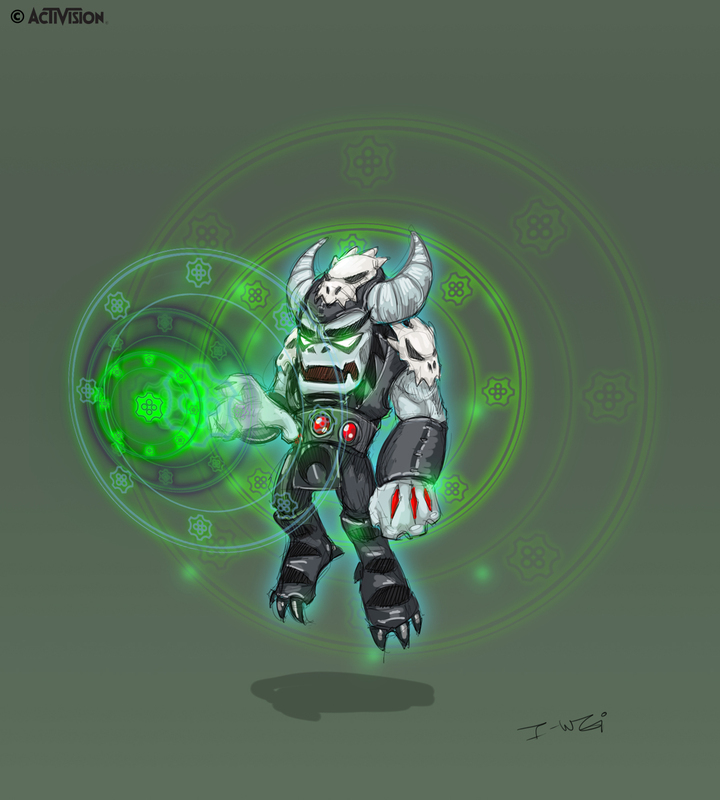 but the mounted canon just didn't feel right, it didn't flow well, and would cover up much of him, especially in-game. The compact character is cool, but the weapons just isn't working. 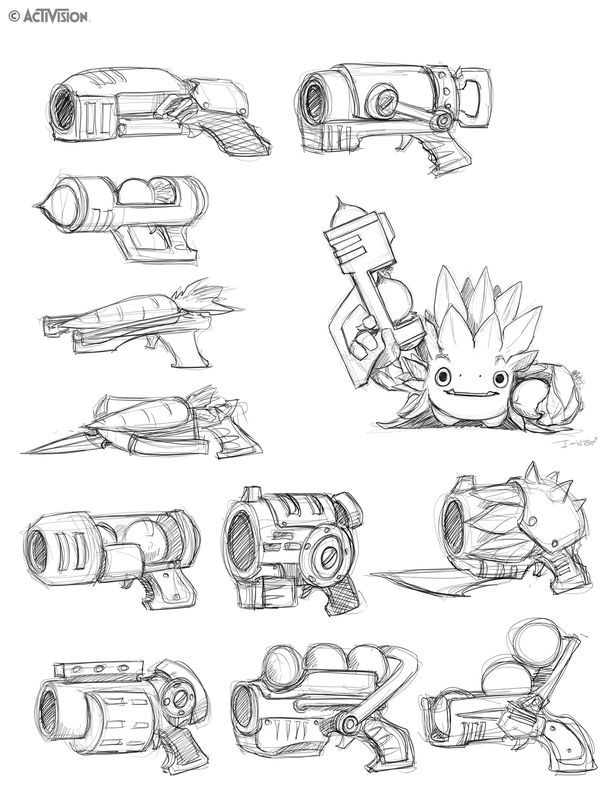 I doodled up a bunch of ideas below, for different weapons and abilities. 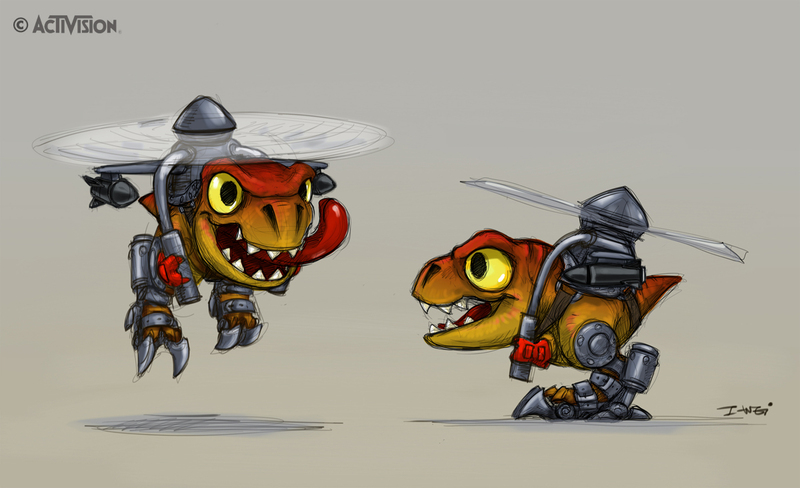 His final form is a T-Rex with Helicopter, Mech-Suit Legs, and Missiles. My inner child imploded with this one. 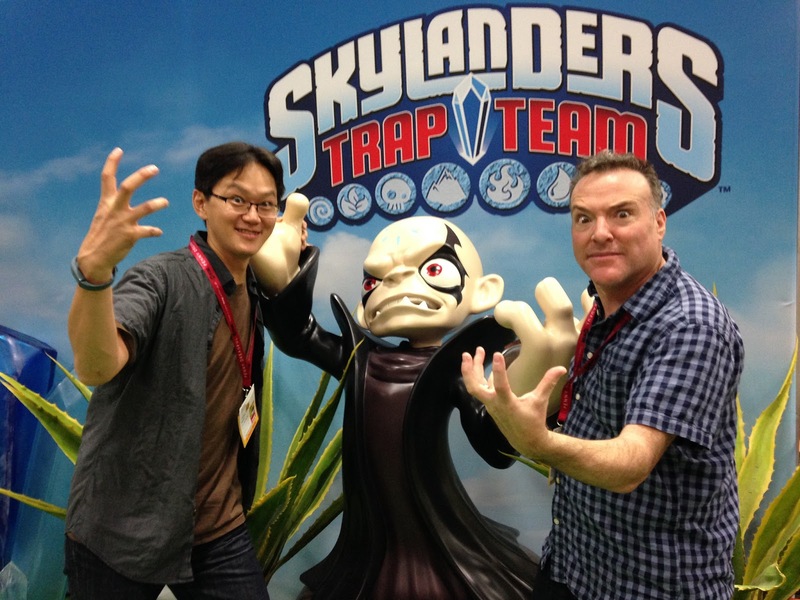 In development of Skylanders; Spyro's Adventure, we needed an ultimate bad guy. 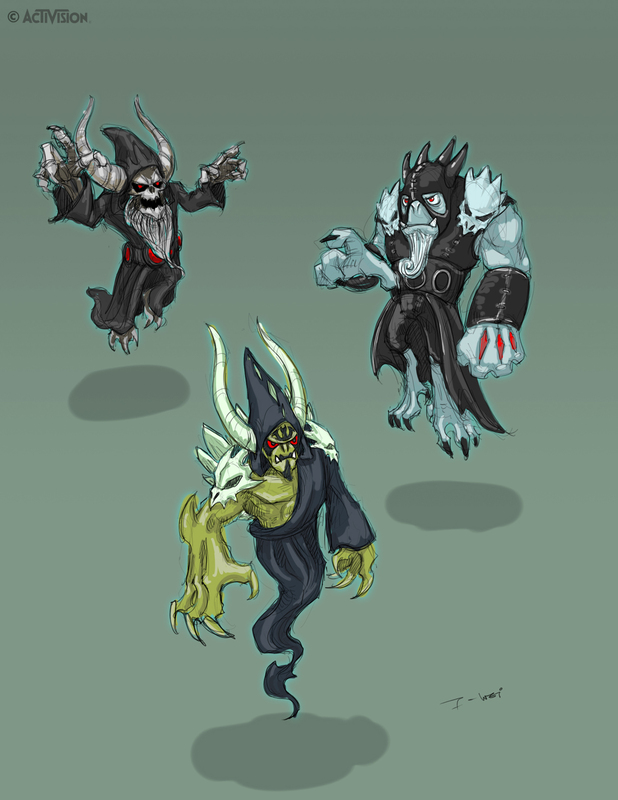 At first, I just started drawing random bad guys, but they all felt too generic, too boring, or too scary. Luckily, Paul Reiche, the studio head and creative force behind Skylanders, had a vision for Kaos. 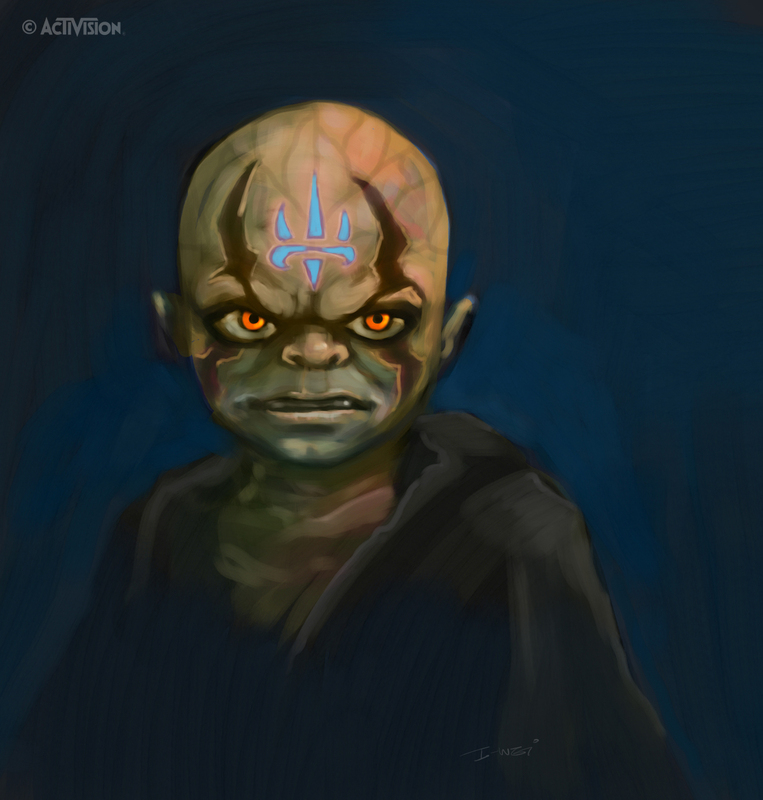 He should be a powerful, but annoying little guy! So I took another stab at him, but what I ended up with just didn't feel like he's got the emotional range needed for the role. Then came a crazy idea. 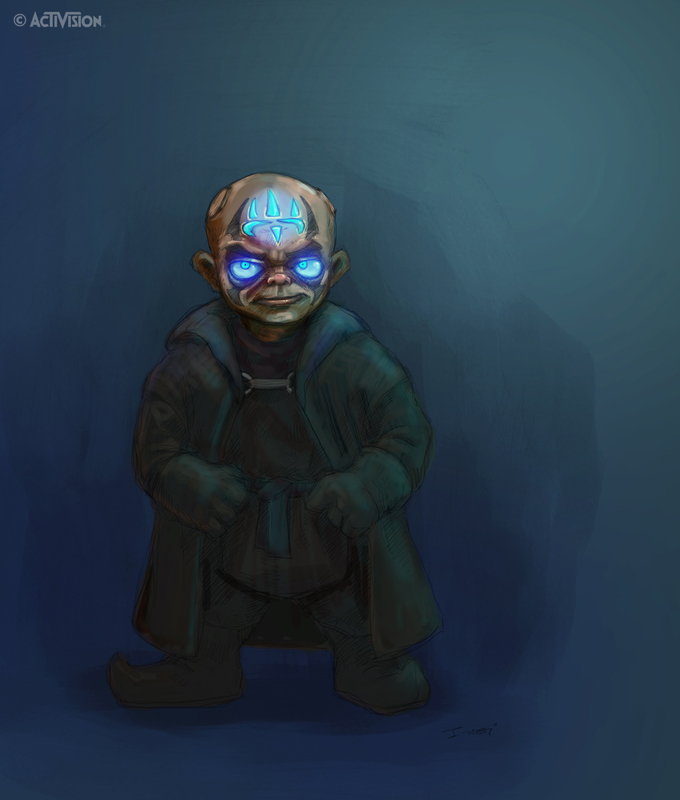 You, the player/kid, is a Portal Master. What if the evil portal master is also a realistic person? So with this direction, I took another quick couple of shots at a small, but more realistic Kaos. 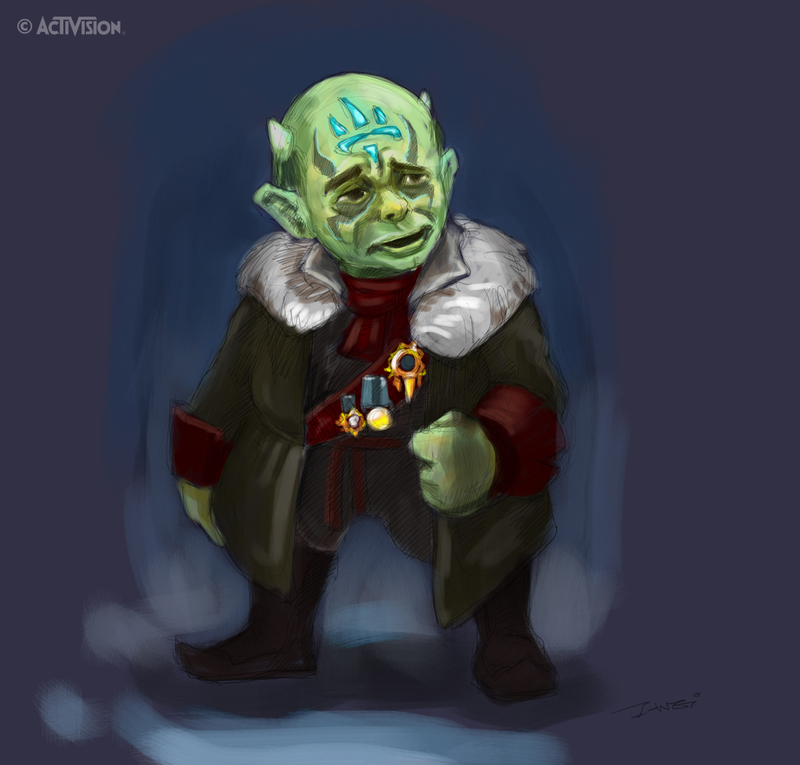 I tried to bring out the Napoleon complex in him, but they just ended up looking pathetic and creepy. So, going for a more powerful feel, and a bit younger, I took another stab at this realistic vibe. In this version, his personality is starting to come through, the facial markings and the overall feel are now something that I really wanted to keep. 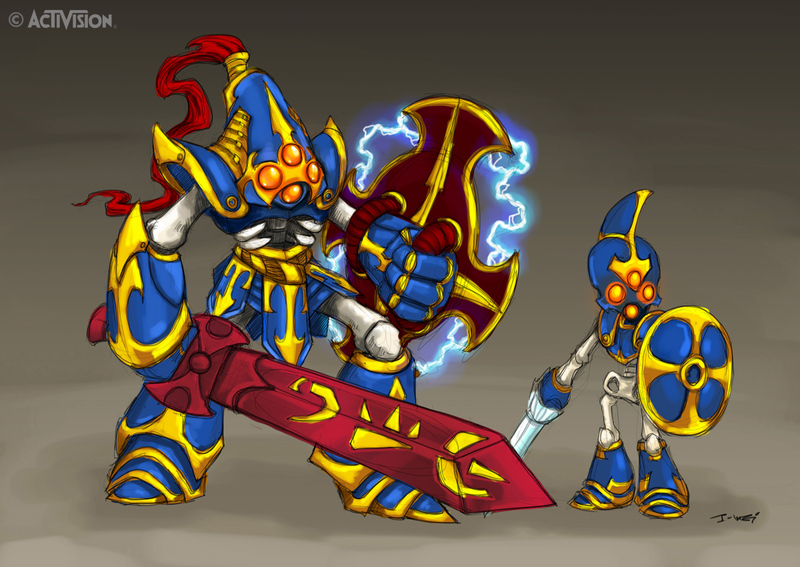 Although this isn't what Kaos ended up, he has the qualities that passed down to the final version. But the realistic-ish look had to go, it's just too jarring to make this kind of transition. So I sat out to make him more cartoony. 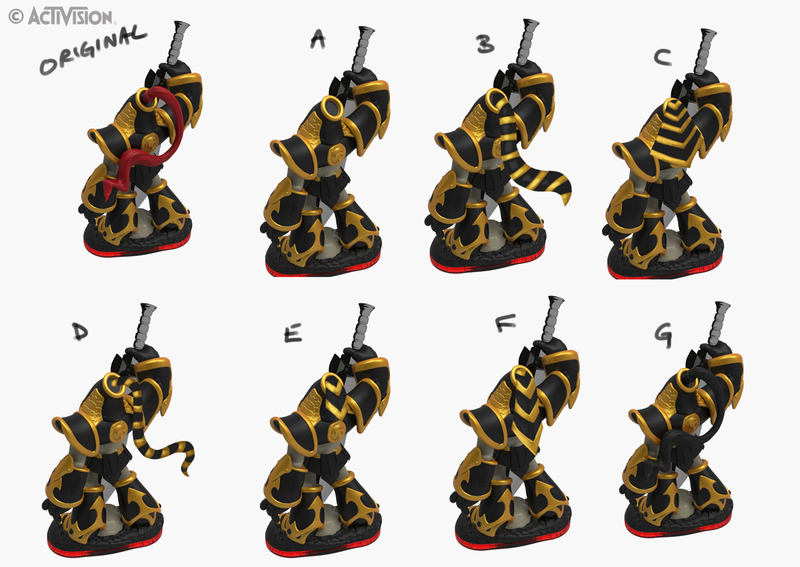 I experimented with a bit with different body styles, while retain much of the same look and feel as before. We ended up liking the bottom left guy here, he's "the most likely villain to take over the world" in this class picture. 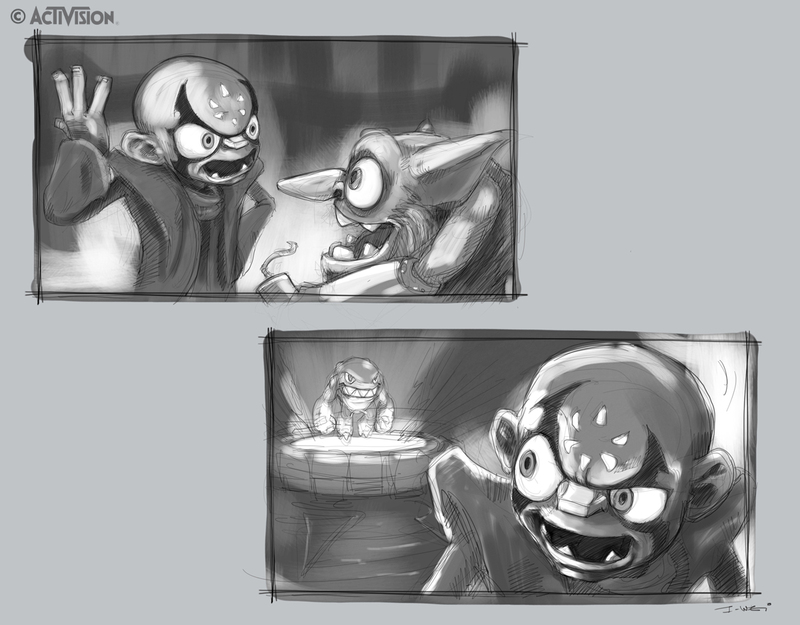 And that's how Kaos was born, along with his Alter Ego floating head, which remained a little more realistic. 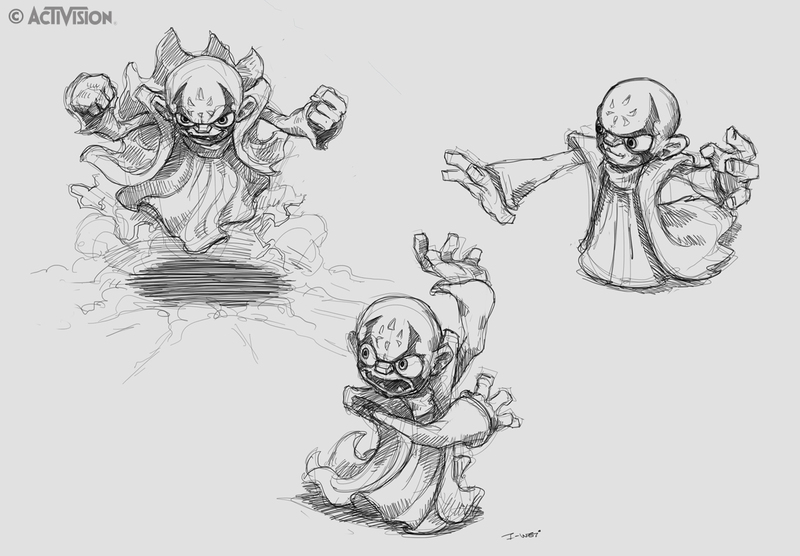 After that, I did some more sketches to get a better feel for his character. But it wasn't until the animators and Richard Hovwits' voice came to being, that he truly became the Kaos that we know today. 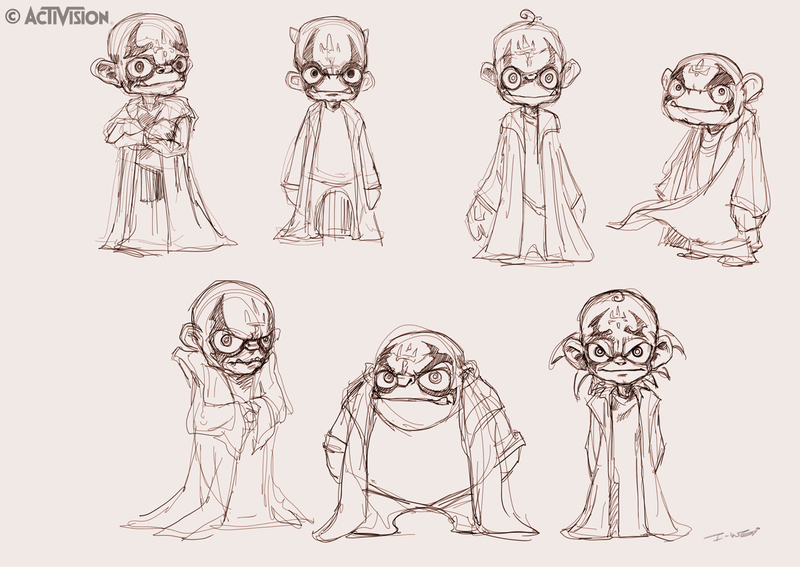 And of Course, he's not complete without Glumshanks! That's all that I can show for now. Thanks for those who attended the panel, and thanks for the fans that came up to chat with me. It was quite a humbling experience, it makes all of the hard work worth while. I hope that you enjoyed seeing some of the behind the scenes stuff here! 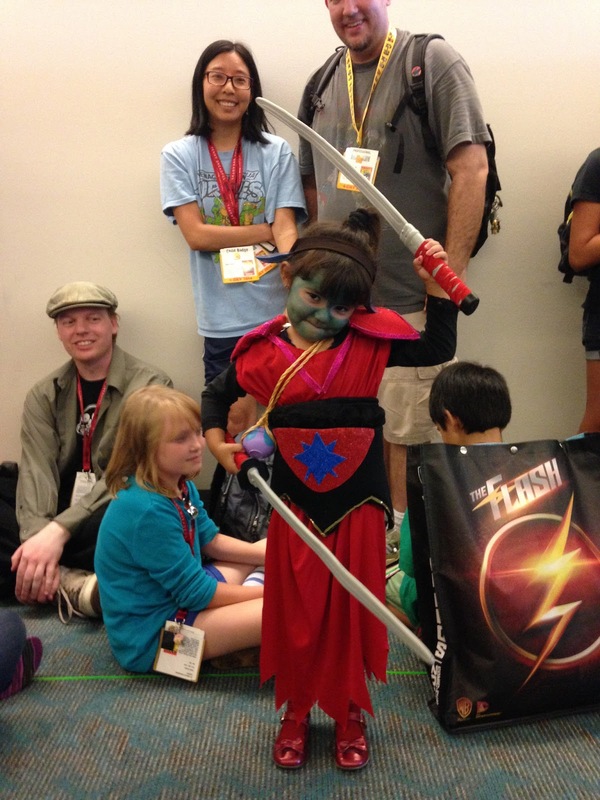 below are some pics from SDCC. 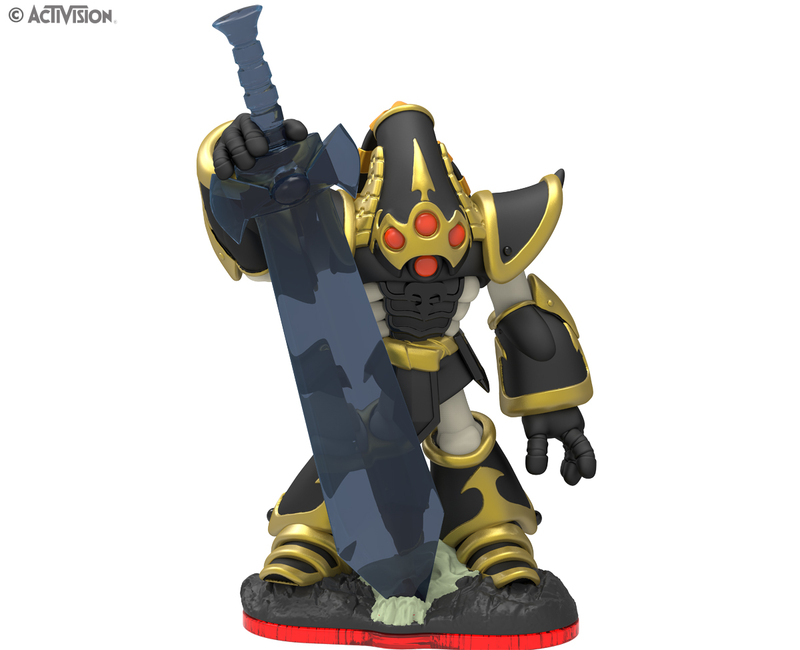 loved the article but could you please make an elephant skylander.